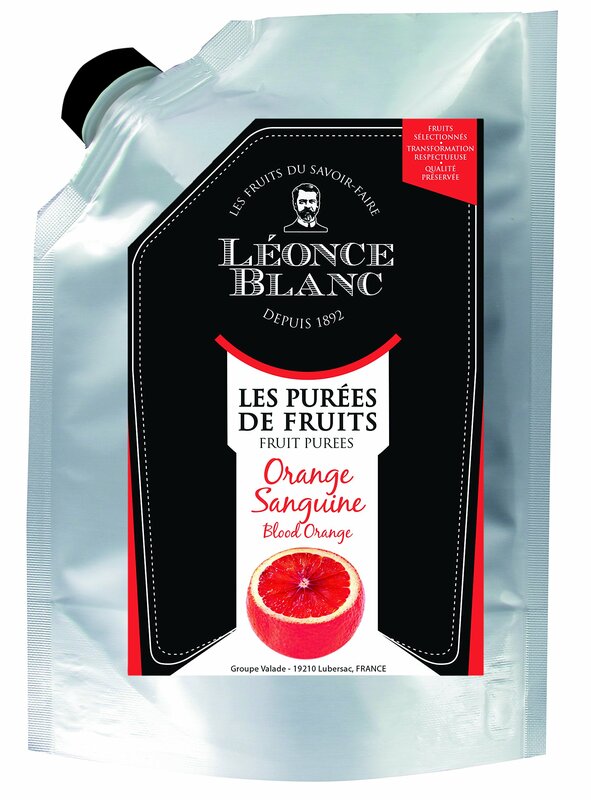 Léonce Blanc – Blood Orange Fruit Puree 1kg. Natural blood orange puree. Léonce Blanc est.1842. Fruit taste and colour, preserved by gentle processing. Free from artificial flavouring, colouring and preservatives. Easy to use straight from pouch. A selection of the best varieties of fruit – To develop each Léonce Blanc recipe, fruit varieties are tested in a laboratory by their experts before selecting the fruit with the best original qualities: a rich organoleptic profile and strong capacity for preservation. Ripeness at the heart of our selection process – It’s because ripeness is essential to guarantee all the organoleptic qualities of the purees, that they control and validate the natural sugar content of the fruit, upon selection and delivery. Recipes designed specifically for each fruit, to reveal all their qualities – Every Léonce Blanc recipe is prepared with a sugar content (Brix) adapted to the fruit’s natural profile. That is the secret behind all the original flavours of the fruit in our products: minimum Brix levels for citrus fruit that is not naturally very sweet and a higher brix to match the naturally sweetest fruits such as mango. Traditional processing that respects the qualities of fruit – Once selected, the best fruit is prepared according to traditional methods. They are refined, to extract all the qualities, then blended with the suitable amount of sugar, pasteurised and immediately frozen to guarantee their preservation and rediscover all the authentic pleasure of fruit. Ideal for bakery, desserts, cakes, tarts, mousses, jelly, chocolatier applications, ice cream/sorbet, sauces, glazes and fantastic for making cocktails. Freeze/Thaw stable. Made in France. Léonce Blanc offer 20 delicious fruit flavours in their ambient pouch puree range.